Gold fell $10.57 to $1391.53 in Asia before it climbed up to $1406.80 in London and then dropped back down to $1395.76 at about 9AM EST, but it then climbed to as high as $1423.22 in early afternoon New York trade and ended with a gain of 0.71%. Silver slipped to $22.32 in Asia, but it then rose to as high as $22.887 in New York and ended with a gain of 0.71%. Euro gold fell to about �1066, platinum rose $15.75 to $1524.50, and copper fell four cents to about $3.33. Gold and silver equities waffled near unchanged for most of the morning, but they then rose to see about 1.5% gains in early afternoon trade and remained near that level for the rest of the day. Tomorrow brings May�s jobs data and Consumer Credit for April. Oil rose and the U.S. dollar index fell as the euro climbed higher after European Central Bank President Mario Draghi said euro zone economic growth should stabilize. Treasuries rose as the Dow, Nasdaq, and S&P ended higher in mixed trade on uncertainty about the fed and tomorrow�s jobs report. Among the big names making news in the market today were Chrysler, LME, GM, JPMorgan, and AT&T. �The Dollar is once again getting whacked, thanks mainly to ECB President's rather rose-colored glasses prognosis of the Eurozone economy. Then again, what is he supposed to say: "the unemployment rate among the youth is approaching critical mass but what the heck do we care about that? Most of us will be dead and long gone by the time it goes kaput. Hey, things could be worse so lighten up and relax a bit"? 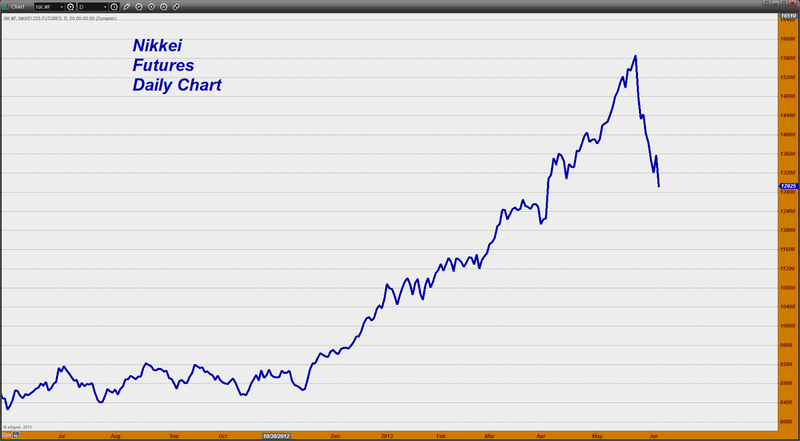 If you want to see two charts that pretty much tell it all, take a look at the Nikkei and the Japanese Yen. The Nikkei futures have dropped 17% in less than a month! That is mind-boggling to me. Now look at the Yen. It has staged a 7% rally over that same time period and is having a monster day to the upside today. It was up nearly 3% at one point during this trading session alone! 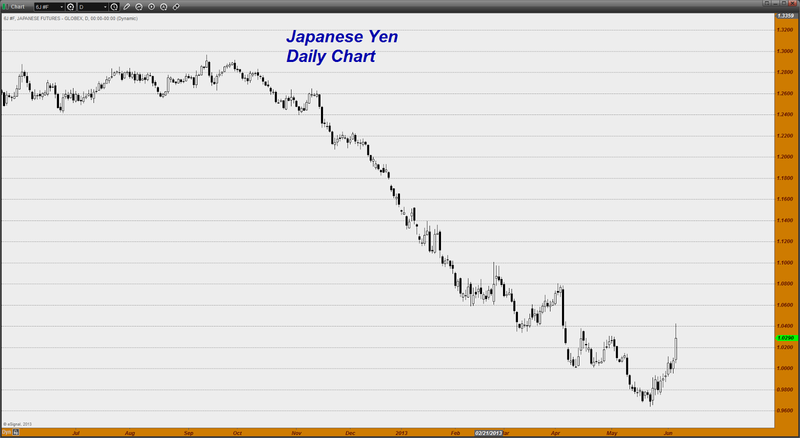 What you are seeing taking place is now a reversal of the Yen carry trade in which money was borrowed in Yen terms and leveraged into stock buys for even greater gains. The rally in the Yen has caused these highly leveraged trades to disintegrate and that is causing a ripple effect across the currency markets and the equity markets as those trades in which every mother and their dog was long the US Dollar and long global equities and are now trying to exit those trades. That is why we are seeing the Dollar being crushed and is also the reason we are seeing gold moving higher. Remember, the big trade was to sell gold and take that money and put it into equities. When the equity markets begin breaking down, money flows out of that sector and back into gold while the Dollar breaks down. Interest rates on the Ten Year, which, a week ago, were near 2.2%, today fell below 2% at one point. I repeat something which I have said over and over again at this site. This bond buying, QE, easy money policy being followed by the Fed has created the most insane volatility I recall ever witnessing in the totality of my entire trading career. I pity the poor risk manager at a mortgage company, an insurance firm, a pension fund, etc. trying to institute hedges to mitigate risk for his/her firm. There is not a single person on the planet who can read this madness and project where this is going more than one day in advance! Imagine trying to decide which side of the market you are supposed to get protection from in this sort of environment! I might make a note here to say, this is what I expect will eventually happen to gold at some point down the road when this monetary experiment in unlimited money creation has proved to be an ultimate failure. The investment world has been herded and corralled into all taking the same side of the same trade knowing that they are being backstopped by the Central Bankers. Once the realization dawns upon them that not a single structural problem has been solved and that the entire "recovery" depends on more crack cocaine being shoved into the victim to ward off the withdrawal symptoms, faith in the almighty Central Banks is going to evaporate. Case in point is what is going on in Japan. The initial euphoria about the bold new monetary and political reform plan to boost the Japanese economy has rapidly soured. Skepticism is rising and with it, caution, and the desire to not be the one left looking for a chair in which to sit when the music finally stops playing. GEAB letter: What happens when the paper gold fraud is understood? COMEX Gold Trust (IAU) Total Tonnes in Trust: 186.88: No change from yesterday�s data. Silver Trust (SLV) Total Tonnes in Trust: 9,988.42: No change from yesterday�s data. Pretivm�s (PVG) drill results, Imperial�s (III.TO) financing update, and Avino�s (ASM) production report were among the big stories in the gold and silver mining industry making headlines today.